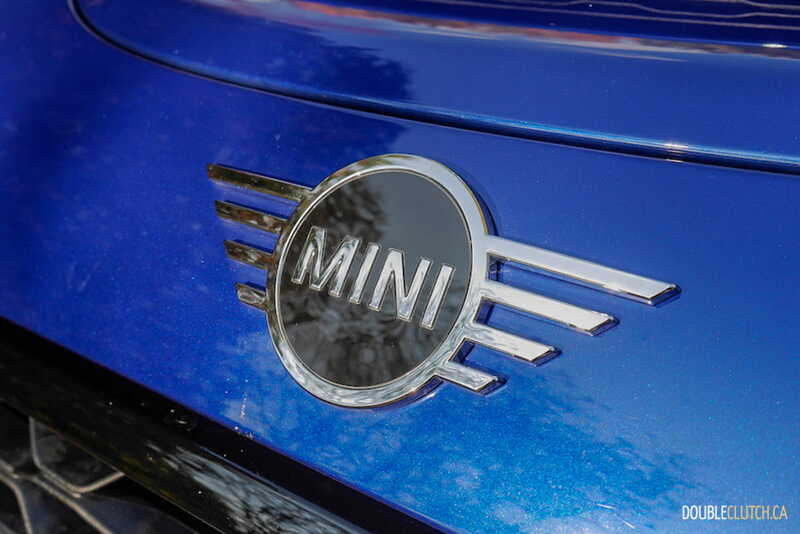 With history dating back to 1959, the MINI is well loved for its compact size and classic hatchback shape. 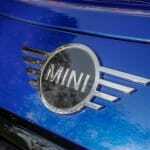 A cultural icon like the MINI has been able to stay popular for six decades because it is adaptable. 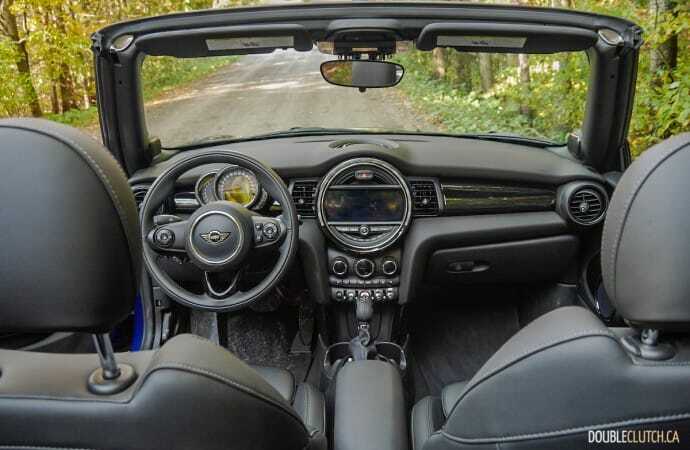 The latest third-generation MINI launching in 2014, seeing developments like changing from the iconic speedometer on the center console to a digital LCD infotainment unit, and launching new five-door hatch versions to go along with the classic three-door body style. 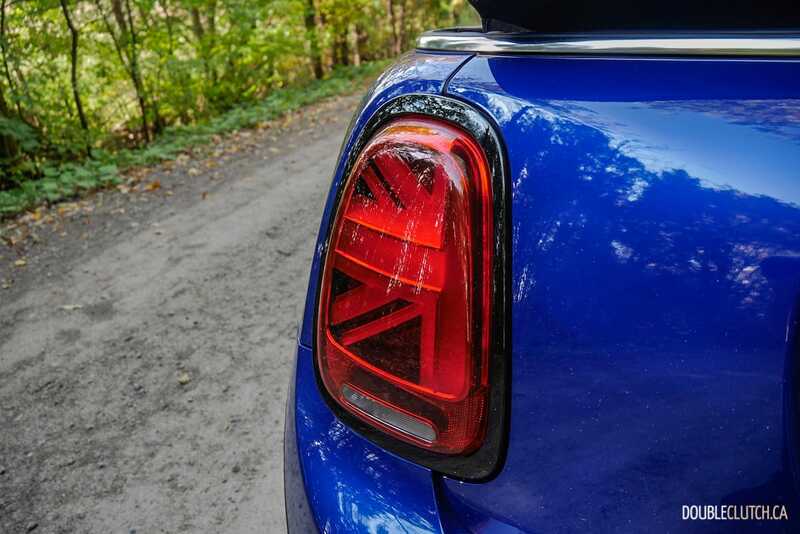 The MINI went through a mid-cycle refresh for 2019, with noticeable updates such as a brand new logo, LED rear lights in Union Jack British flag design, newly designed headlights that feature a LED halo daytime running light, and MINI logo projection from the exterior mirror. 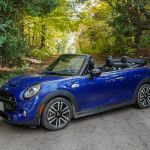 We borrowed a 2019 MINI Cooper S Convertible painted in stunning Starlight Blue to see how whether the newest model carries the same MINI magic that has allowed it to become the icon that it is. 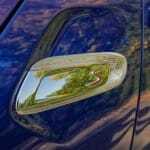 I have always been a big fan of the MINI Cooper’s styling, and the latest refresh has achieved the difficult task of keeping the unmistakable styling while making it look updated and modern. 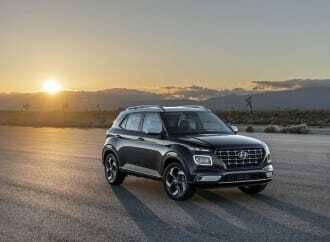 The new headlights with the LED halo daytime running lights are sharp to look at and also house the turn signals. 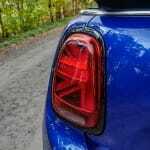 It received several compliments on the new LED rear lights that are designed to remind passersby of its British roots, and they look particularly fitting on this Starlight Blue example. 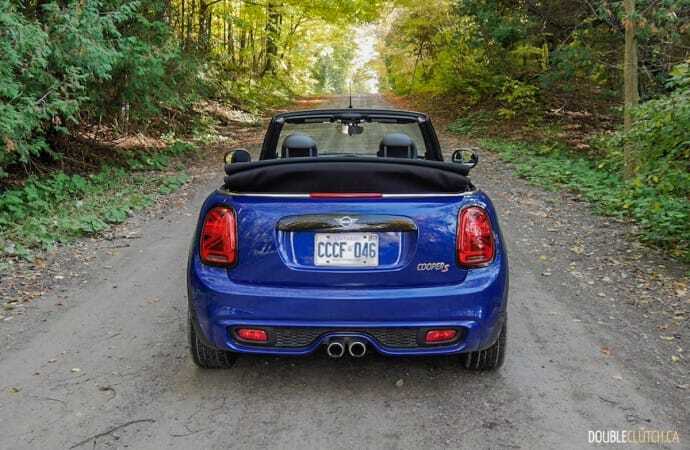 During the first three days of the test week, Toronto got a dose of record breaking warm weather and we were able to enjoy the Cooper S with the top down. Convertible roof operation is quite easy; essentially the same process as opening a sunroof on most cars with one toggle switch. 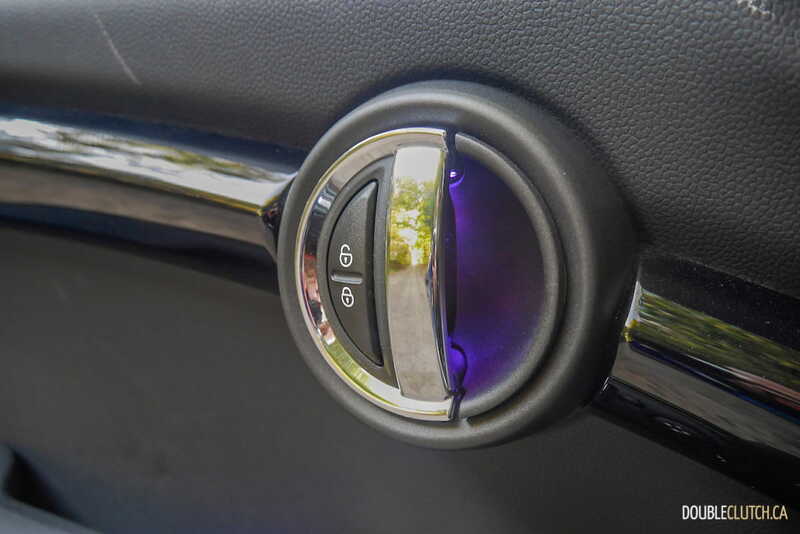 It locks and unlocks itself automatically, and the procedure can be done at speeds up to 30km/h. 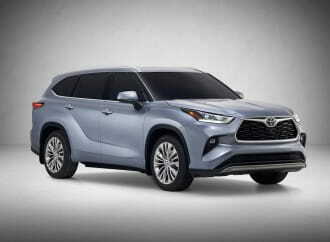 The convertible top also serves as a sliding sunroof that can be opened halfway to let passengers absorb some Vitamin D without worrying about a messy hairdo. 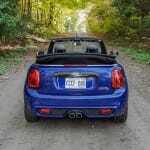 Driving the MINI Cooper S in its top-down form is absolute bliss. 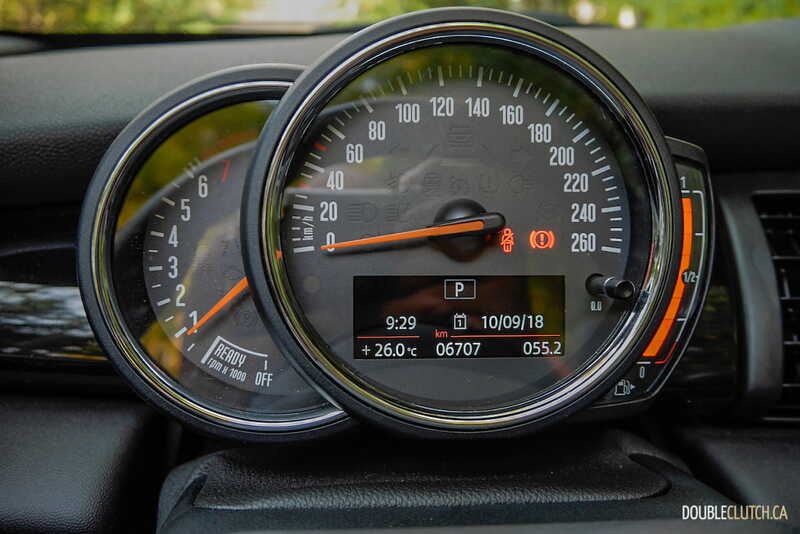 I strongly suggest that you keep the car in “Sport” mode, which opens up the exhaust and enables the MINI Cooper S to snap, crackle and pop in traffic. I have gone on the record to say that I am not a fan of modern exhaust trickeries that creates the artificial burble, but the MINI manages to create a sound that matches its fun personality. 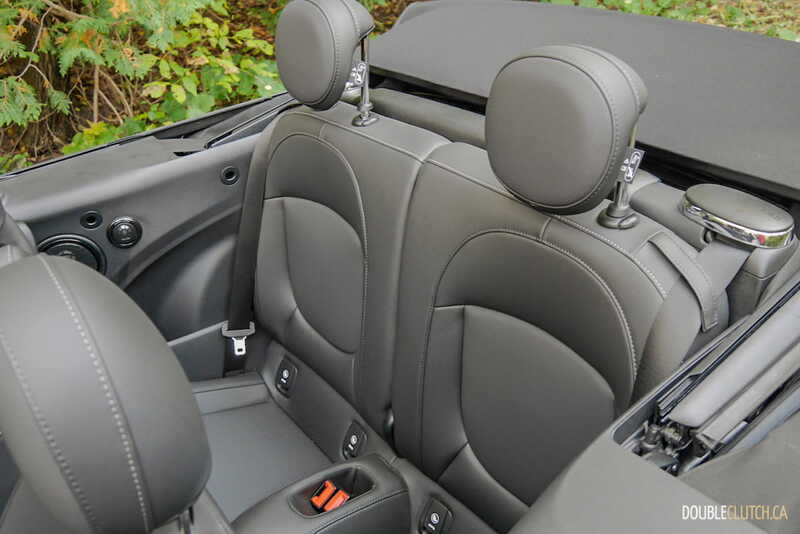 The Cooper S Convertible does not have a wind deflector behind the seats, so there is a noticeable buffeting issue with the top down. There is ample headroom in the cabin, and the large windows help the interior feel airy and not cramped like typical roadsters with the roof up. 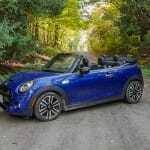 There is a fair amount of wind and road noise in the cabin, which is to be expected with soft-top setups. 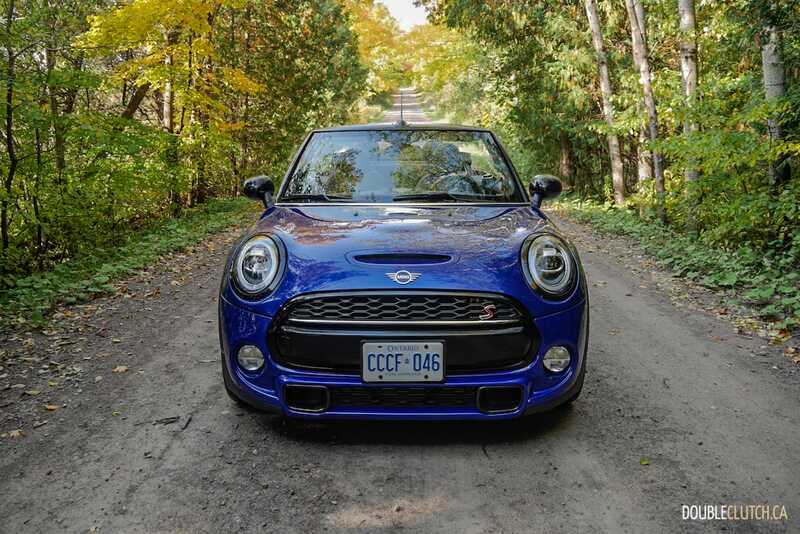 The good part is that you will be able to hear the snap crackle pops from the exhaust, electrifying the MINI Cooper’s driving experience. 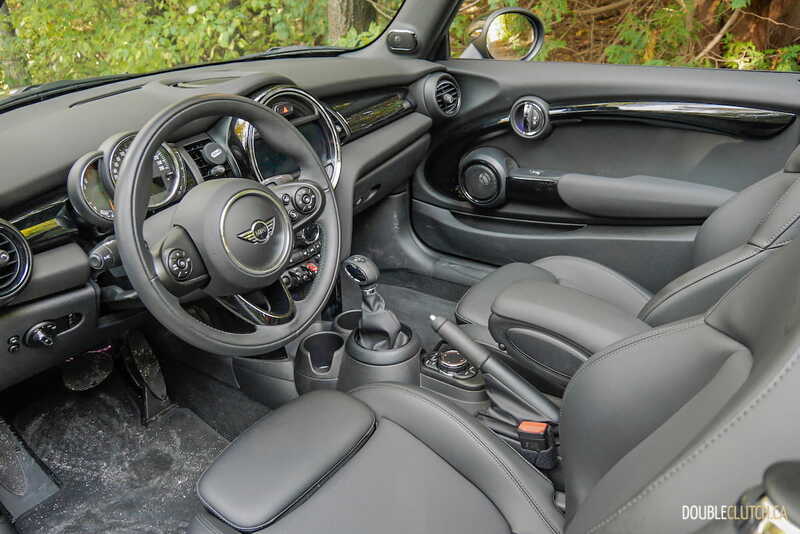 Following along the exterior design language, the Cooper S Convertible’s interior also features a modern twist to its iconic design. 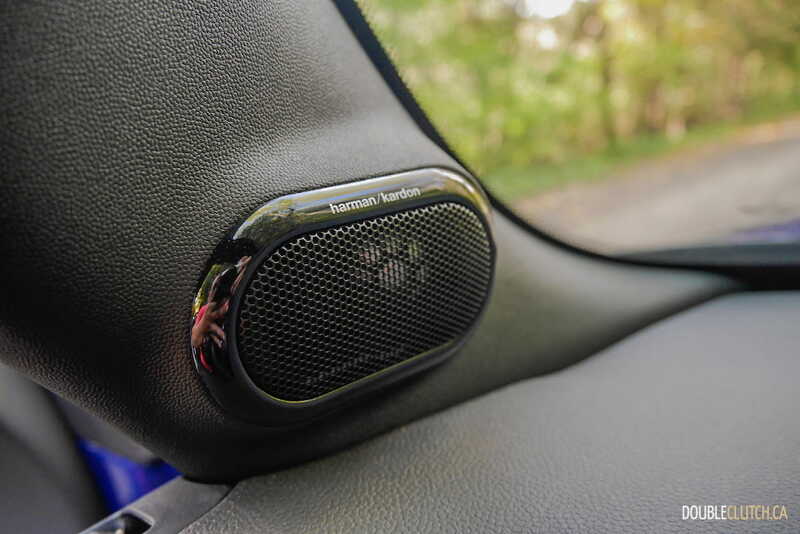 My tester, equipped with the Starlight Blue Edition Package, features piano black interior trim, dual-zone climate control, carbon black leatherette seating surfaces with heat in the front, and a Harman-Kardon sound system. 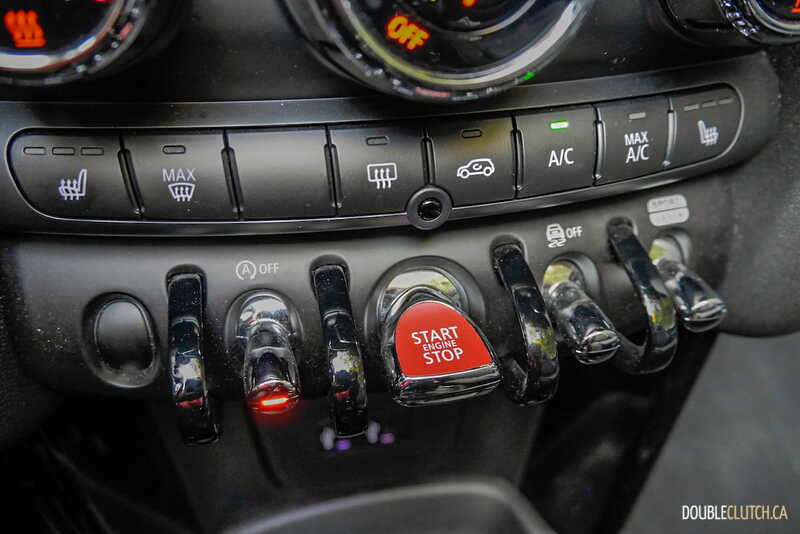 The interior layout looks like a classic MINI with retro chrome toggle switches that are nice to the touch and easy to operate. 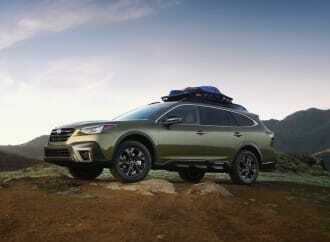 Interior materials feels upscale and the cabin comes across as much more expensive than its MSRP would otherwise suggest. The highlight of the cockpit is on the 8.8” touchscreen display that can be controlled with touch or a rotary dial beneath the center armrest. It does support Apple CarPlay but not Android Auto. 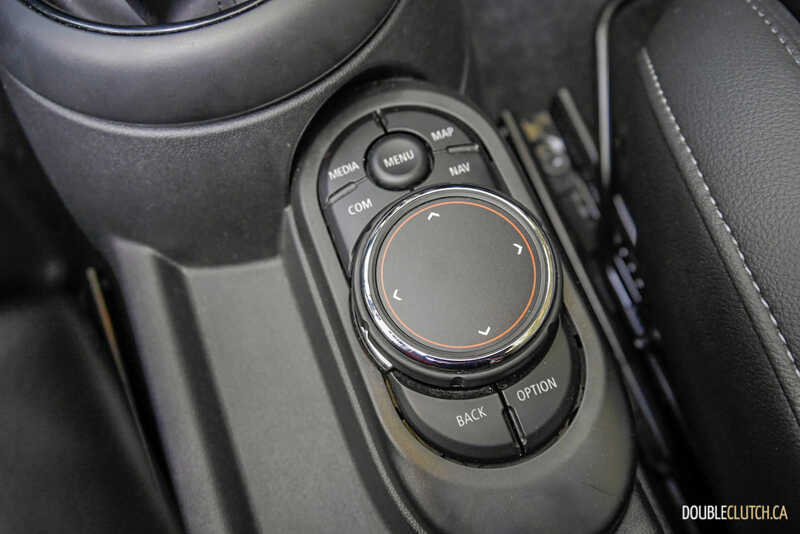 Using a similar infotainment system from its parent company BMW, the iDrive-based system is very user-friendly with simple intuitive command inputs using the dial. 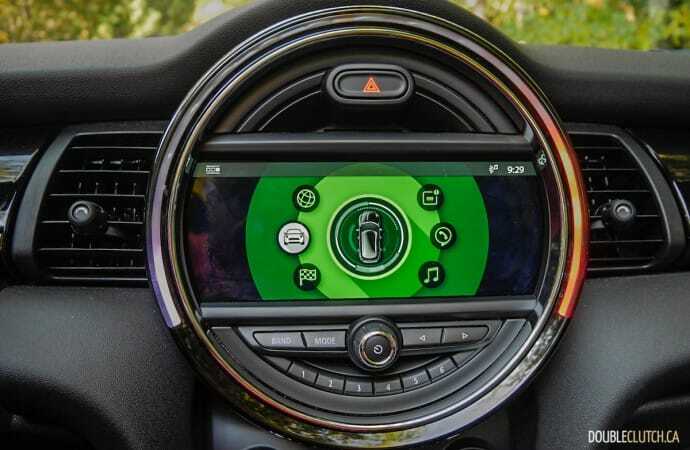 Although it is essentially a shared infotainment system with BMW, the interface features a dedicated MINI design, featuring youthful graphics and a more playful overall theme. One of my favourite features of the infotainment actually lies outside of the screen, and it is the LED centre instrument ring that changes colour in response to engine speed, climate control, interior lighting preference, and sound system volume. 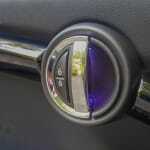 When driving, the ring changes colour constantly in response to inputs, brightening up your drive. 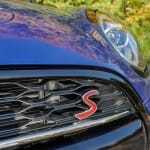 All of MINI’s effort to make the Cooper S a fun car would be ruined if the actual drive were not an engaging one. Fortunately this is not the case here. 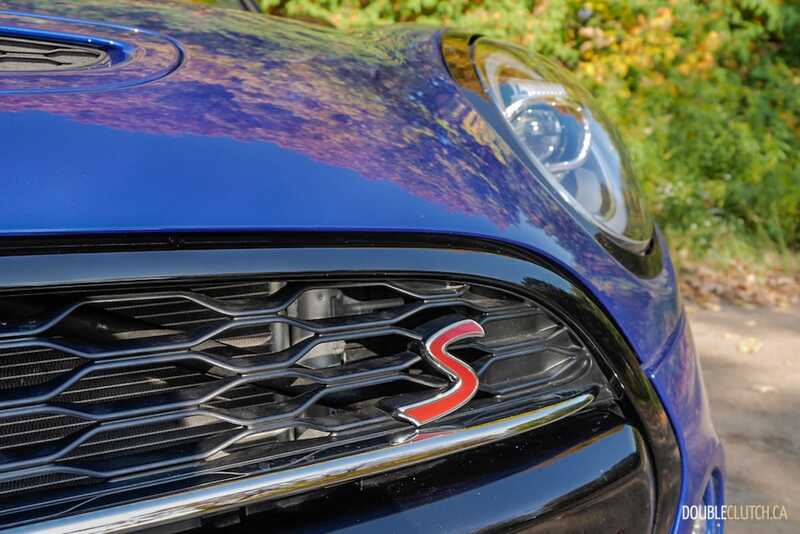 The MINI Cooper S is powered by a 2.0L four-cylinder with a twin-scroll turbocharger. 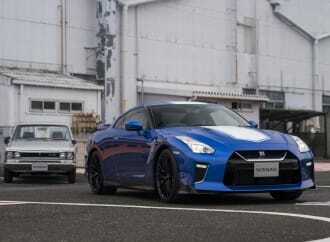 It produces 189 horsepower from 4,700 to 6,000RPM, and maximum torque is 207 lb-ft. at 1,250RPM. 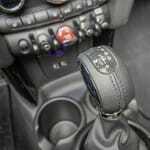 My tester’s power is delivered to the front wheels using the optional six-speed automatic gearbox with manual shifts available using the shifter. Paddle shifters were curiously omitted, which would make for an even sportier experience. 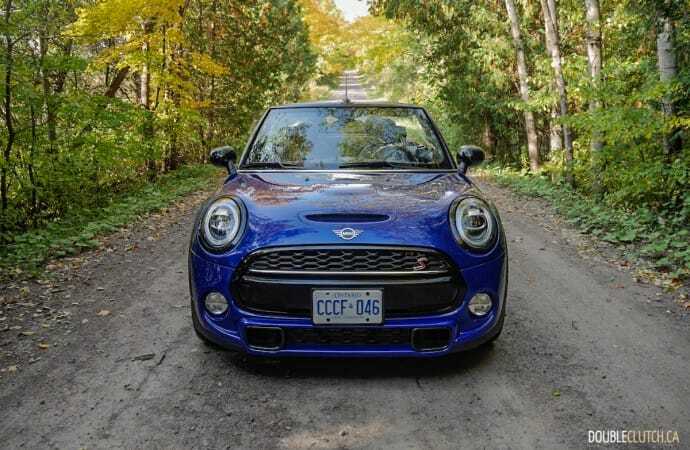 Given the mechanical specifications, you would be able to correctly guess that the Cooper S is comfortable being in the city. The twin-scroll turbocharger spools up quickly and turbo lag is nearly nonexistent. 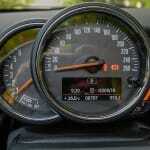 The Cooper S does run out of breath at the higher rev range, but that is acceptable given the purpose of this car. 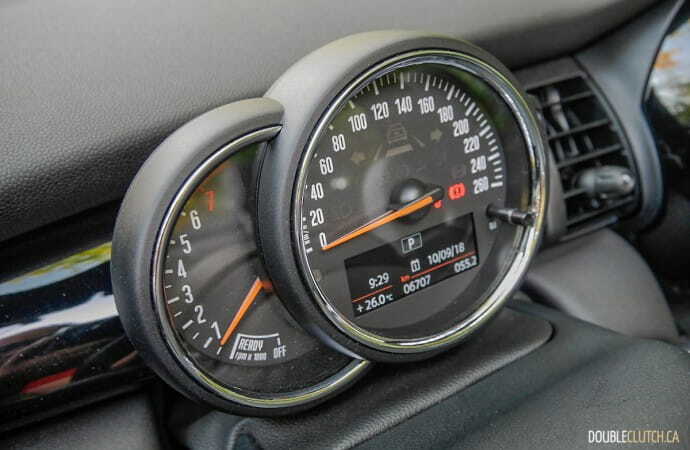 MINI offers three distinct driving modes (Mid/Sport/Green). 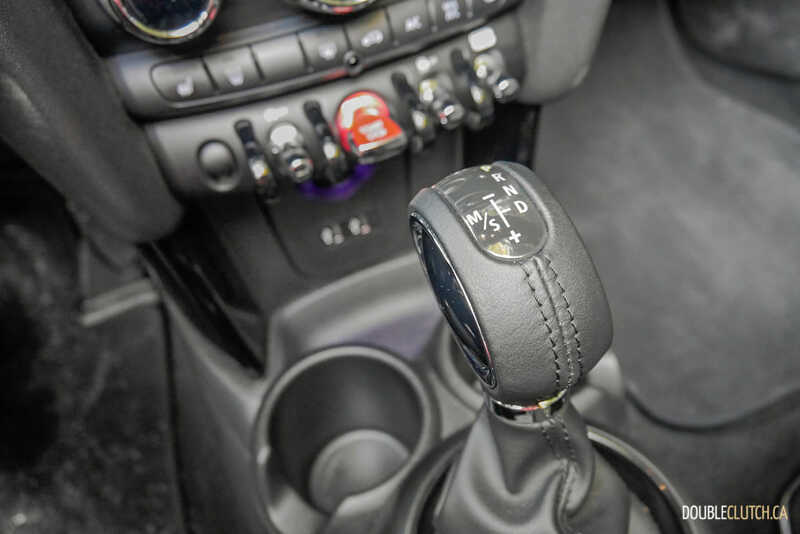 Throughout my week of testing I kept it in the Sport mode, which dials up throttle and steering response, sharpens the Dynamic Damper Control system, and holds onto gears longer. 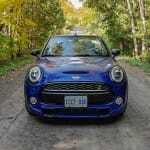 Overall the MINI is a significant step up from the base model’s 1.5-litre 3-cylinder turbocharged engine (reviewed here). For those who would really like to go-fast, there is a John Cooper Works model that adds 39 hp and 29 lb-ft. of torque, along with unique suspension tuning and other performance goodies, for $7,500 more. 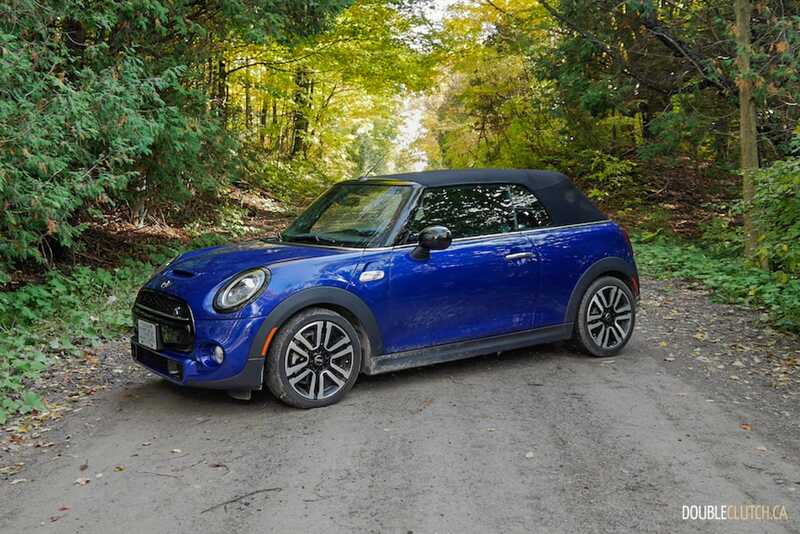 Handling is another area that the MINI brand is known for, and the 2019 Cooper S Convertible is no exception to that. 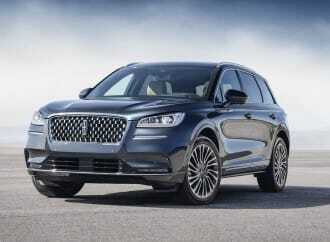 Driving around the city, the car feels lively and nimble. Although the car’s dimensions have gotten larger over the years, it still offers that classic go-kart feel going into and out of corners. 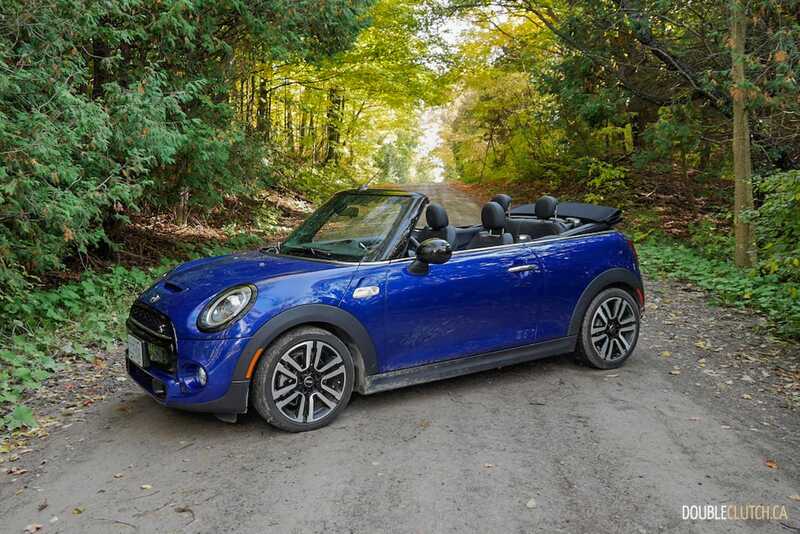 Given its front-drive setup, understeer is observable when you accelerate hard out of corners, but again that’s beyond the purpose of this joyful convertible. It’s appreciable how BMW has tuned the MINI’s electric steering; it is nicely weighted and offers better road feel than some BMW entry-level models. With the help of lightweight materials such as aluminum alloy, twin scroll turbo engine, Variable Valve Timing and Valvetronic technology, the MINI is excellent at being efficient. 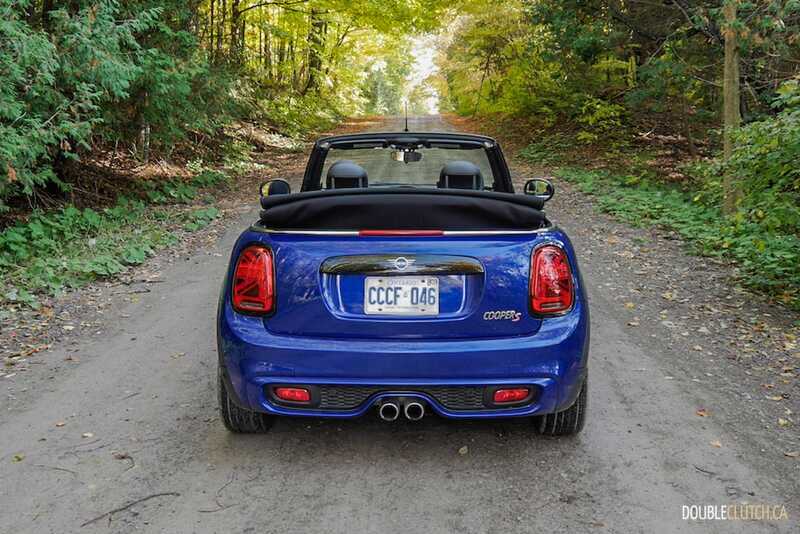 The Cooper S Convertible with automatic is rated at 9.3L/100km in the city, 7.1L/100km on the highway, and 8.3L/100km combined. During my week of testing, which consisted of mainly city commutes, I was able to achieve a fuel economy figure of 8.4L/100km. 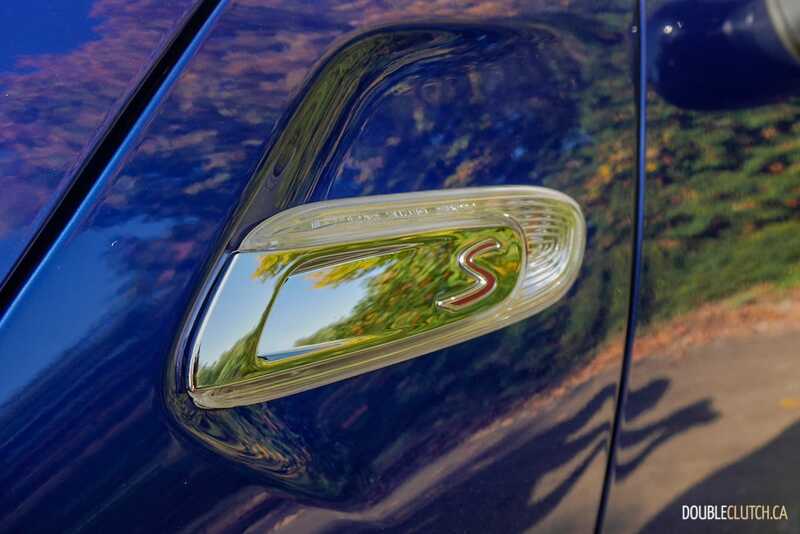 The Cooper S will accept a maximum 44L of premium fuel, allowing it to travel more than 500km before needing refuel. 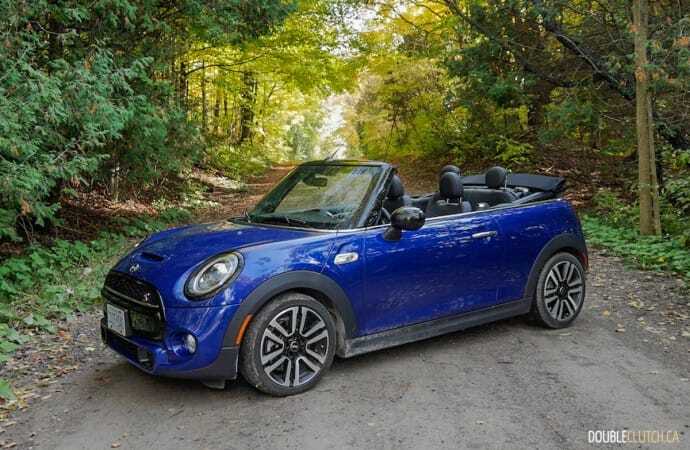 The 2019 MINI Cooper Convertible starts $29,690, with the as-tested Cooper S Convertible starting at $33,990. This tester was equipped with the Starlight Blue Edition Package, a $2,900 option, which in my opinion a worthwhile package to consider. 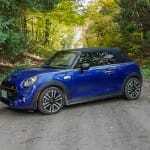 This adds with exclusive features such as the Starlight Blue paintjob and 17” Rail Spoke alloy wheels. 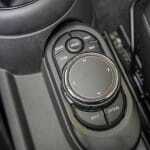 The optional automatic transmission is a $1,400 option (stick with the manual! ), bringing the as-tested total to $38,290. 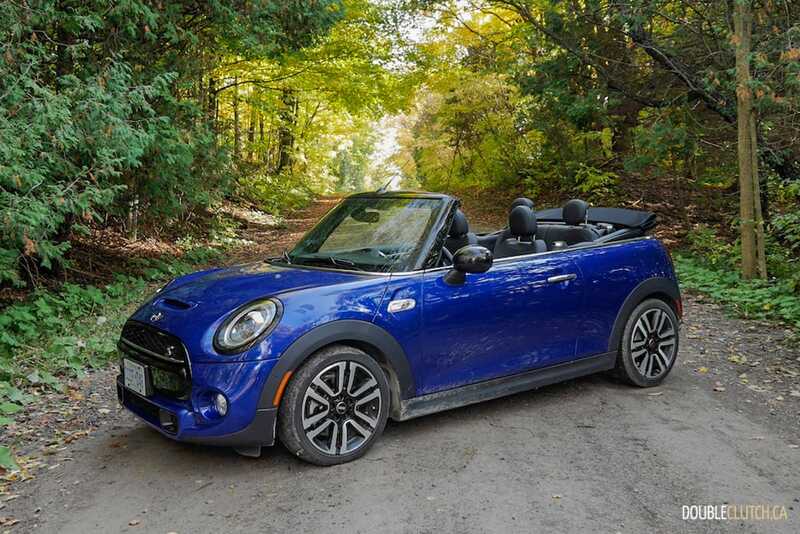 The 2019 MINI Cooper S Convertible is a special car. It is built with a purpose in mind, which is to deliver a fun experience reflective of its personality. 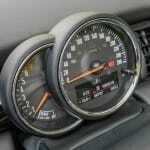 It fully embodies the MINI culture and creates enjoyment from the second you enter the car. 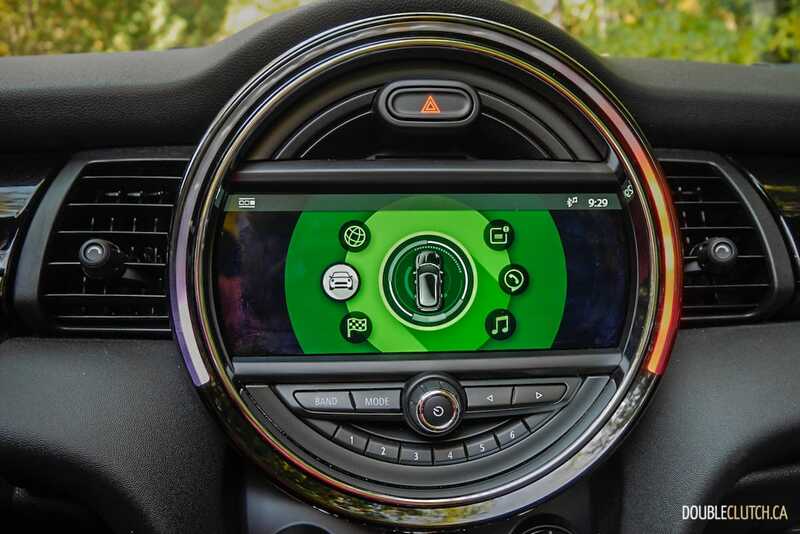 Whenever you notice the MINI’s animations on the infotainment, or hear the pops produced by its exhaust, or when sending it out of a corner, drivers will genuinely smile. 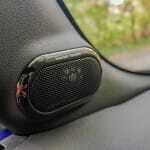 To me, that is what the MINI magic is and we’re thankful BMW has been able to keep it alive and well.